April No Falls, a national and international campaign, aims to educate and raise awareness of falls prevention and help those at risk of falling to stay on their feet. 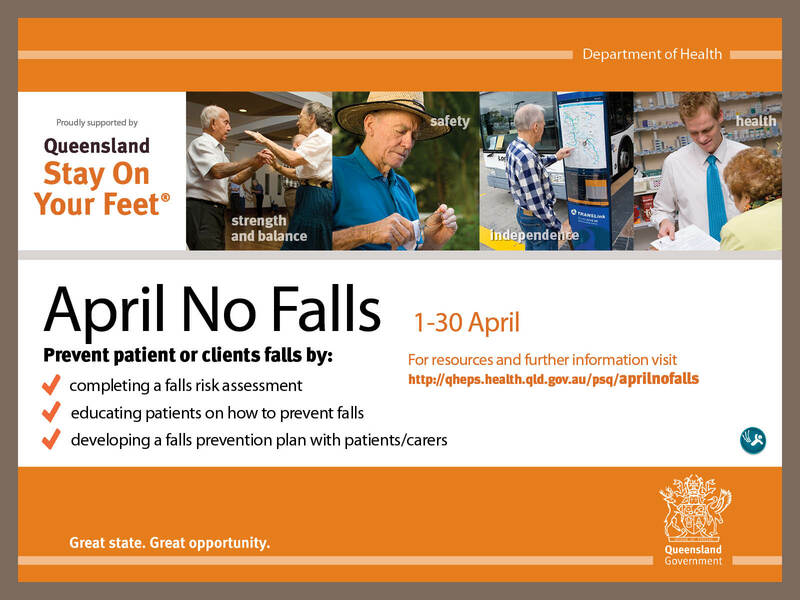 Queensland Stay On Your Feet®—a collaborative, statewide falls prevention program aimed at reducing the frequency and severity of fall-related injuries among older people. Ageing with Vitality: Your Everyday Guide to Healthy Active Living—based on healthy, active ageing principles. The department’s Strategic Outcome 1—Queenslanders live longer, healthier and more independent lives. National Safety and Quality Health Services Standards—Standard 10: Preventing falls and har m from falls. complete the Falls Preventing Falls and Harm from Falls online education at iLearn@QHealth. visit www.health.qld.gov.au/stayonyourfeet for more information and resource.